The Atticus Hotel welcomed a new restaurant to its main floor March 4. Red Hills Kitchen officially filled the space vacated by John Gorham’s Bless Your Heart Burgers. 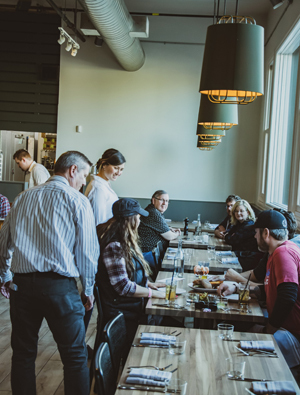 The new restaurant, inside downtown McMinnville’s newest hotel, is the second installment from Jody and Michelle Kropf, the duo behind Red Hills Market in Dundee. The husband-and-wife team launched that restaurant in 2011; it has proceeded to become a popular wine country stop for picnic fixings, wood-fired pizzas and various specialty items. McMinnville adds yet another restaurant to its sprawling portfolio. The number of options for a town of its size — especially in and around Third Street — is quite impressive. 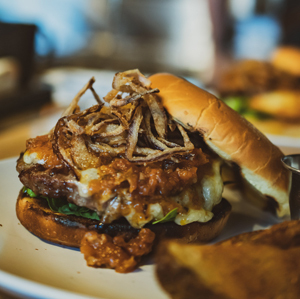 Fellow establishments like Nick’s Italian Café, Bistro Maison, Thistle and others have helped mold the Willamette Valley town’s regal culinary reputation. Red Hills Kitchen welcomes walk-ins, and a small grab-n-go section caters to those looking to pack a meal along on their outing. Guests of the Atticus Hotel can order from a room service menu or enjoy a cocktail in the lobby; a sleek bar touts an assortment of drinks and small plates for accompaniment. The space is clean and vertically stretched, with the Atticus Hotel’s signature raised ceilings. There’s a mix of whites, blues and browns with detailed tile flooring. A pair of tall windows next to the entrance throws a nice amount of natural light toward the bar. While very much its own contained environment, Red Hills Market feels like a natural extension of the hotel at large. The Kropfs have been looking to expand for about the last two years. “We wanted to capture the momentum and opportunities that Red Hills Market has given us,” Jody says. Their search took them to potential locations like Bend and the Santa Ynez Valley in California. Ultimately, they wanted to stick closer to home in an environment they’ve fully embraced. Much like Red Hills Market, the approach here is embedded in the surroundings. Jody calls on his vast agricultural backyard for creative inventory and inspiration. Being just an hour from the coast, there’s also a significant seafood streak as well. “Our culinary whims are heavily influenced by the many conversations we’re having with foragers, farmers, fish mongers, ranchers and all you happy eaters,” he says. No stranger to the hotel world, Jody formerly worked at The Heathman in downtown Portland. He recently helped some friends open Mad & Vin in Solvang, California, a similar outpost to Red Hills Kitchen in that it’s a higher-end restaurant operating from within a boutique hotel. 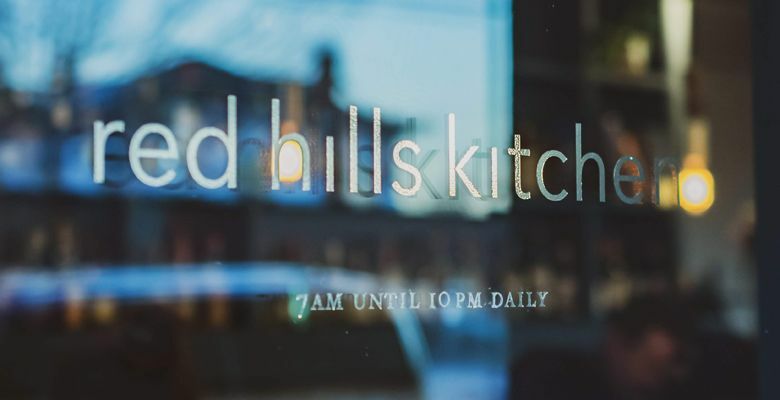 Being where it is — in the very heart of Yamhill County wine country — Red Hills Kitchen features a creative wine program curated by Willamette Valley producers. Currently, Cody Wright of Purple Hands Winery in Dundee is spotlighted. He worked with the restaurant to create a blue print for the wine list, one that will change every season with a new producer offering new suggestions. In addition to offerings from his own label, there are asterisks throughout the list that note selections made by Wright of other recommended producers. The glass pour list is locally dominated, with current pours from St. Innocent, Big Table Farm and ROCO, to name a few. The bottle list is much more expansive, without a great deal of markup. The small retail corner of the restaurant features wines from the likes of Goodfellow, Schaad Cellars, DePonte, Suzor and more. There are non-alcoholic beverages, toffees, Jacobsen salts and other snack-y items. It’s an easy pop-in for residents or tourists looking for a quick nibble or gift. In terms of grub, there are a host of appetizers, like the deviled eggs with scallions, wasabi and smoked steelhead roe. The crispy baby artichokes are also of note, served with saffron chili aioli and nicely roasted. For dinner, the present lineup is a healthy mix of Oregon-minded surf and turf. There’s seared sea scallops, a grilled New York strip with Pinot Noir sauce and charred pork shoulder with carrot mole and pesto. For those already missing the previous establishment, there’s a house burger, served with tomato-bacon jam and charcoal-fired Jojo potato wedges. The Atticus Hotel has made a point of showcasing local artisans under its roof. Its walls are adorned with original artwork by local painters and many of the furnishings, plants, snacks and coffee come from nearby producers. In that sense, Chef Jody’s preference for local ingredients is right at home here. Red Hills Kitchen is a fitting hotel tenant and will delight many in wine country already familiar with the Red Hills Market model. The new addition better matches the higher-end atmosphere of the Atticus Hotel, too. A luxury hotel shouldn’t have any trouble fetching $30 to $40 for entrées. But the inclusion of a bar menu and to-go items will ensure that it’s a welcoming mix of guests, tourists and locals, alike. So far, the transition has been pretty seamless. “I love the intimacy of this beautiful space and the connection to the people coming to enjoy the bounty of Yamhill County,” Jody says.